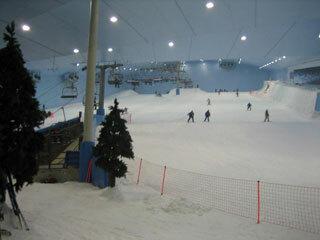 Ski Dubai is an indoor ski resort with 22,500 square meters of indoor ski area. It is a part of the Mall of the Emirates. Opened in November 2005, the indoor resort features an 85-metre-high indoor mountain with 5 slopes of varying steepness and difficulty, including a 400-metre-long run, the world's first indoor black diamond run, and various features (boxes, rails, kickers) that are changed on a regular basis. This article uses material from the Wikipedia article "Ski Dubai", which is released under the Creative Commons Attribution-Share-Alike 3.0 License.